Over the past few years, Facebook have been steadily reducing organic reach. Which means businesses now reach far fewer people for free, when they post something on their Facebook Page. Facebook’s reason for doing this is obvious. By reducing organic reach, they encourage businesses to advertise. This strategy has been very effective and there are reportedly now more than 6 million active Facebook advertisers. However, organic reach has not disappeared completely. You can still consistently reach people on Facebook without having to pay, with a Facebook Group. I’m not advocating that you spam lots of Facebook Groups with links to your website. That is a waste of time and quite frankly annoying. Instead, you should create your own Facebook Group. By creating a Facebook Group and getting people within your target market to become members, you can market to those people on a regular basis without having to pay. And the big difference between a Facebook Group and a Facebook Page is that members of your Group will actually see your posts – which is a big deal! So how do you convince people to join your Facebook Group? 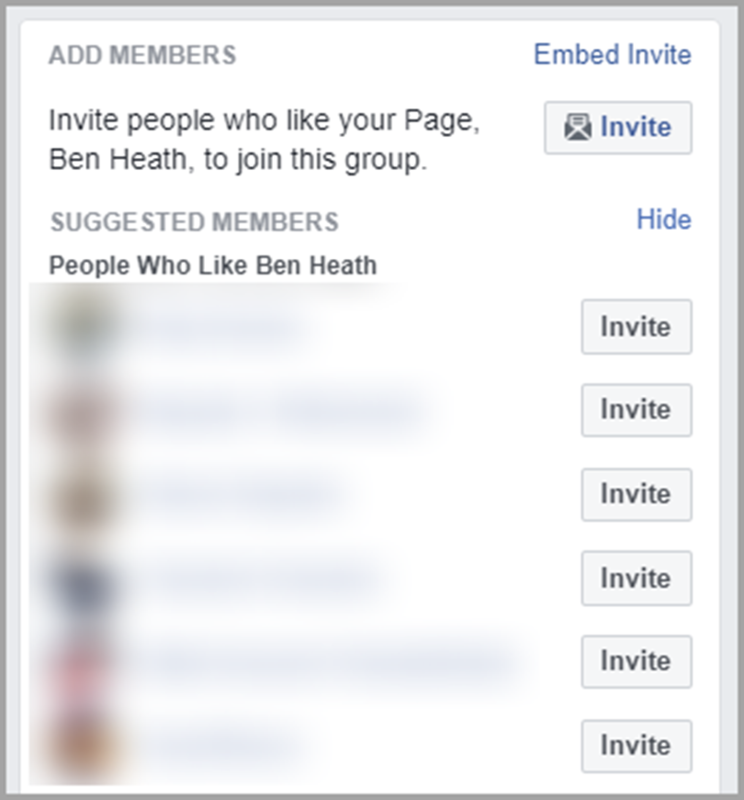 This article will show you exactly how to generate 1,000+ Facebook Group members quickly. For the purposes of this article, I have focused on growing a Facebook Group as opposed to creating one. If you haven’t already created a Facebook Group, here’s Facebook’s support documentation on how to do that. You can generate members by directly advertising your Facebook Group. But I have found that’s expensive and ineffective. Instead, you should link your Facebook Page to your Group. Doing so is straightforward and you can click here for Facebook’s instructions. If you’ve been active on Facebook for a while, it’s likely that you already have a number of Page likes. Inviting those people to join your Group is very effective. I consistently see 50%+ of the people invited, accept the invitation to join. It should be noted that Facebook won’t let you invite everyone at once. You have to invite each person manually and Facebook seems to limit you to around 50 invites per day. But if you have thousands of Page likes it won’t take very long to reach the 1,000-member mark in your Group. However, not everyone reading this will have thousands of Facebook Page likes and some will have brand new Pages. If that’s the case, you can advertise your Page to generate likes and then invite those people to join your Group. I have found this is much more effective than advertising your Group directly. 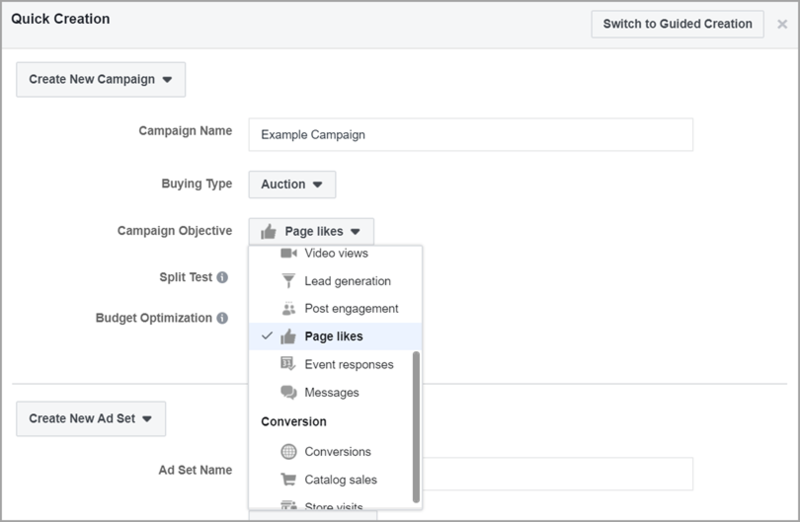 Here you need to give your campaign a name and select the Page likes campaign objective as you can see above. 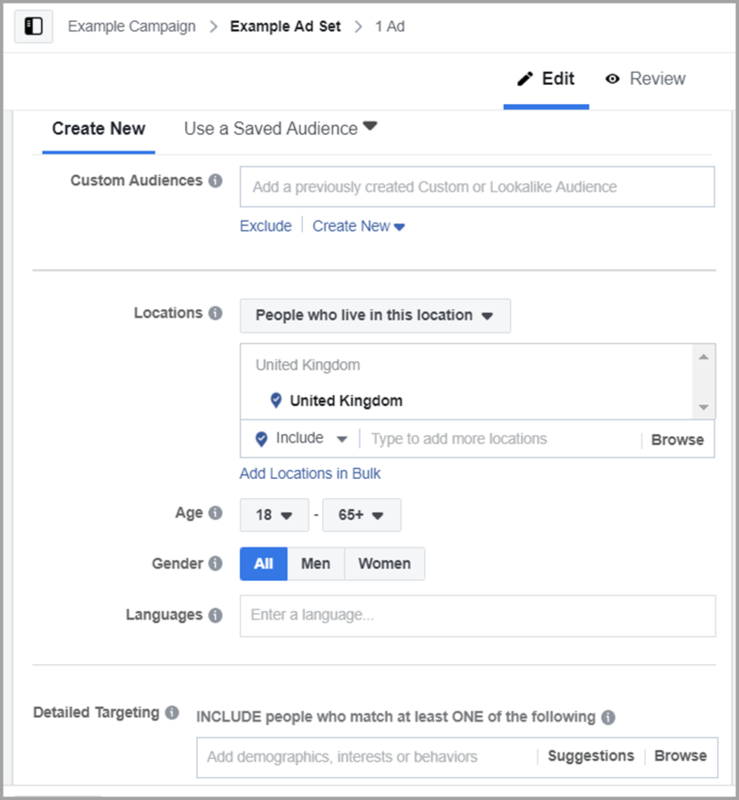 Selecting the right campaign objective when you create a Facebook ad campaign is very important as Facebook will optimize that campaign to meet your objective. Then give your ad set and ad a name, and click Save to Draft at the bottom of the page. When looking to generate new Page likes it’s very unlikely that you’re going to advertise to warm audiences. Therefore, you can ignore the Custom Audiences section. Start by adding the Locations you would like to target. I would recommend making this as large as possible. But, bare in mind that it should be within your area of operation as a business. After all, there is little point building a Facebook Group that is full of people that can’t become customers of yours. Then set your Age and Gender parameters. Again, I would recommend leaving this as open as possible. Page like campaigns work best with large target audiences. After that, you may want to add Detailed Targeting criteria. If you operate on a local basis, or your product/service has mass market appeal then I wouldn’t add anything here. However, if your product/service is quite niche then you may want to add something that is closely related to your industry. You can leave the other settings as default. All you need to do is set your budget and then move onto the ad. 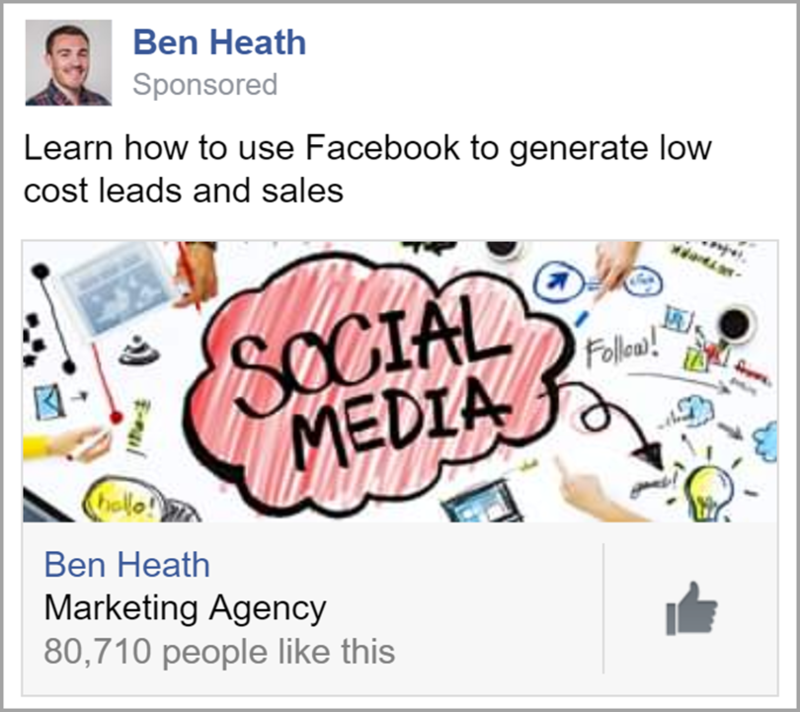 Facebook ads that are designed to generate Page likes should be very straightforward. You simply want to include an interesting image that is related to your industry. And include a bit of information about what your company does, and why people might want to like your Page. The ad images in Page like campaigns are formatted differently to most ads as you can see above. Which means not all images will work. The image above works well because it is interesting and colorful, which helps grab people’s attention. It also immediately lets people know what this ad is about. Here I’ve used short and simple copy, and I’ve told people why they should like my Page. It’s very important that your copy focuses on why people should like your Page. You may need to experiment with a few copy and ad variations to create an ad that can perform well and generate Page likes inexpensively. As your Facebook ad campaign starts to generate Page likes, you obviously need to invite those people to join your Group. The quicker you invite someone to join your Group after they have liked your Page, the more likely they are to accept the invitation. I would recommend that you do this on a daily basis. It only takes a couple of minutes, but having hundreds or thousands of members in your Facebook Group can be well worth it. Organic reach on Facebook has almost completely disappeared. One way that you can still reach people without having to pay for it, is with a Facebook Group. Directly advertising a Facebook Group is expensive and ineffective. I’ve found that generating Page likes and then inviting those people to join your Group, is a more effective strategy.